Jump starts trucks and V8s! The Brightech Scorpion Jump starter is the top product in a range of four lithium ion jump starters that Brightech produce. To call this jumpstarter a gadget would be to do it a disservice however, as this is a portable workhorse! Looking very similar to the PowerAll, but retailing for a few dollars more, this jump starter packs the same maximum starting power as the Powerall, but gives away a little in the mAh department. Can the Scorpion justify it’s higher price point or is this a sting in the tail that Brightech will regret…. For more information on the manufacturer of this model see our Brightech info page. Still have questions? Leave them in the comments box at the foot of the review and we’ll post a helpful response! We’ve analysed every Brightech Scorpion customer review we could find and collated the statistics into the following chart so you can see at a glance how the Scorpion is rated by actual verified owners. These reviews were collected from large online retailers and totalled over over 100 individual reviews from actual verified Brightech Scorpion owners. 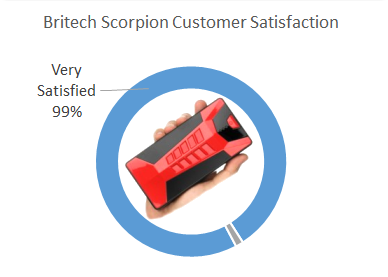 As you can see Brightech have achieved a remarkable level of customer satisfaction with the Scorpion. This is due to the fact that this device delivers exactly what it says it will, ie great jump starting power again and again, and also thanks to Brightech’s industry leading customer service with a 3 year guarantee. 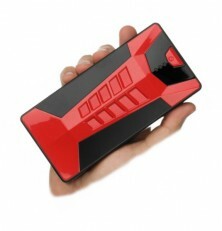 What’s Special about the Brightech Scorpion Jump Starter? A capable ultra-portable jump starter should make the Scorpion a shortlist contender for anyone looking for a jump starter, but what makes it special is the remarkable 90% customer satisfaction rating. Throw in the collection of extras shown in the photo below and you have a compelling package that’s difficult to find fault with. 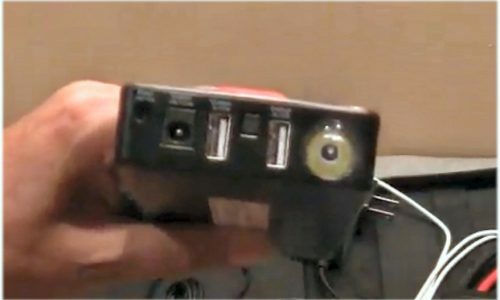 The gadget charging feature will charge cameras, phones, camcorders, bluetooth headphones and handheld gaming systems. If this feature is important to you, remember that the Powerall can also charge two gadgets at the same time, and is a few dollars cheaper than this Scorpion. 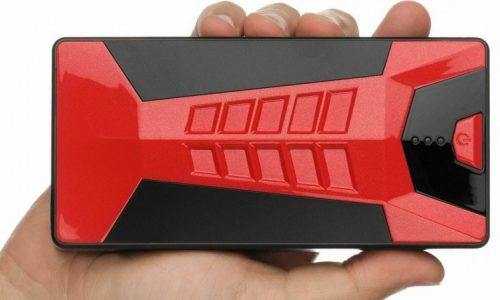 This Brightech Scorpion Jump Starter is capable of fast charging an iPhone from empty to full in around an hour, perfect for those occasions that google maps and a satnav app drains your phone faster than you can make it to your destination! 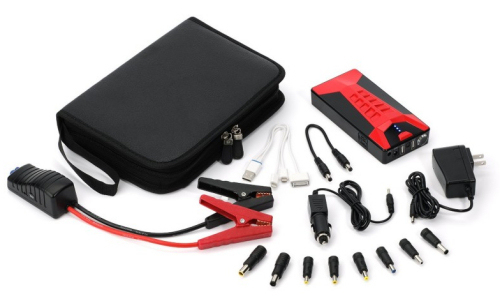 The Brightech Scorpion Jump Starter makes for a great birthday or Christmas gift for new drivers as it can be stored so easily anywhere in a car and will come to the rescue of depleted items from an mp3 player to a laptop, right up to a car battery. It is a remarkably capable device backed by a remarkable 3 year guarantee. Same power as a conventional battery powered jump starter! Lighter than the PowerAll, how is that even possible?! Because you know you are going to need this lifesaver in the dark, right? Charging Adapters. No more worries about gadgets, phones, laptops or tablets running out of power when on the move if you have the Britech Scorpion with you. The Brightech has two USB charging ports meaning that it can charge your phone at the same time you are browsing the web on your laptop! Weighing in at just under 1 Ib this tiny but capable jump starter is so small it will even fit in your toolbox! A pleasing design makes lead acid jump starters look bulky, unwieldy and dated. 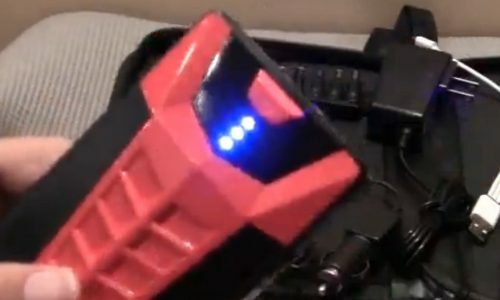 There is another lithium jump starter that looks exactly the same as the Brightech Scorpion. Please do not confuse this alternative product from Bestek with the model reviewed here from Brightech. Does the Scorpion come charged? If the Scorpion starts making a clicking noise you should immediately try to start the vehicle as the charging process is ready for cranking the engine. New Scorpion jump starters generally come with 75% charge, however Lithium batteries should recieve a good full first charge before jump starting. We would therefore recommend charging a new Scorpion for around 3 or 4 hours before first use. There are not many lithium powered jump starters in the market, but to be honest, of the few that exist, it is difficult to choose between them as every one that we have tested and reviewed is very very good. The stand out difference with the Brightech Scorpion Jump Starter is the terrific 3 year guarantee from Brightech – a first for jump starter warranties. The fact that it charged my iPhone in under an hour was the icing on the cake, so this jump starter comes highly recommended! 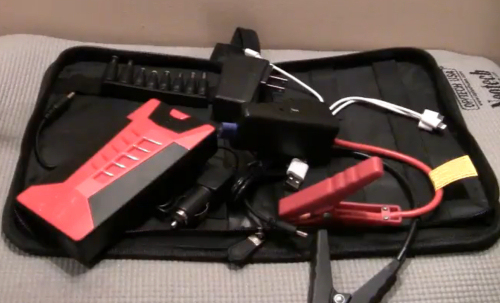 For a similar lithium ion jump starter take a look at the PowerAll. On the very first use, the negative clamp broke. I reported the problem to Brightech and was shipped another unit very quickly. Customer Service was friendly, great to deal with and very, very fast to solve the issue. I would buy another product from them just based on their level of customer service. I could put at least 25 of these in the space my battery takes up in the truck! In fact, this device fits in my glovebox! 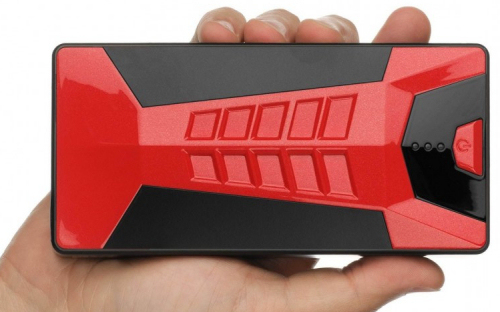 This small hand held device packs some serious energy. I have used this at least four times within the month on November 2014 when we had some fridged weather. Thanks to this portable charge. I can safely say it’s a must have in any vehicle, I would definitely recommend this to any car user or mechanic. I have never used or even seen a kit like this. Flat out outstanding. Started the car right up when we needed it and we hadn’t even given it a charge yet.